Ho'oponopono infinity circle pendant/necklace, in recycled sterling silver, made in NY, NY. This Ho'oponopono necklace measures approximately 24mm tall and 2mm thick. The pendant is cast and hand finished in NYC and is USA made. The sterling silver is a minimum of 92.5% recycled metal. The chain, in your choice of lengths, is a bead chain in a 1 mm thickness. 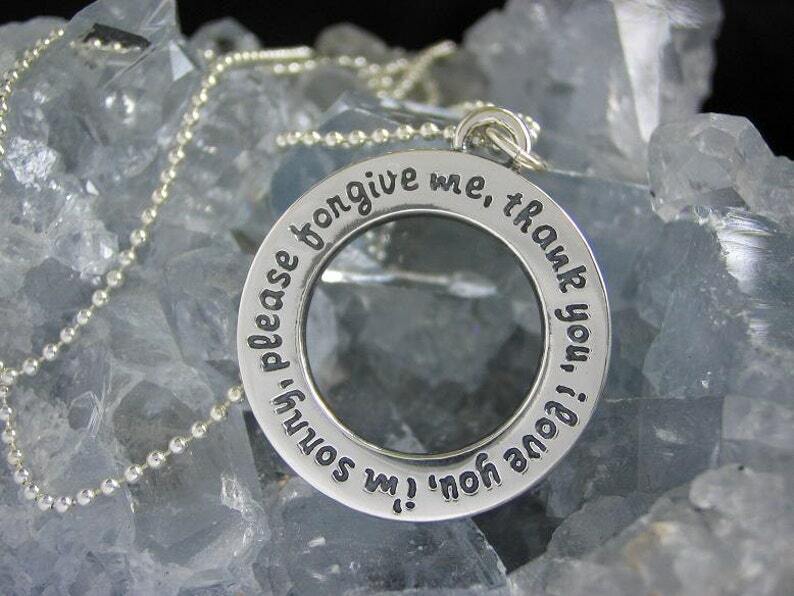 The ho'oponopono necklace contains the 4 phrases used in ho'oponopono, "I love you, I'm sorry, please forgive me, thank you," as a circular pendant to support the wearing in cleaning throughout the day. This item is made to order and may take 2-3 weeks prior to shipping.